The systematic criminal misuse of a heretofore secret supercomputer administered by the “national security state” has revealed several instances of treason in high places and sedition in low ones. Truly, it doesn’t get any bigger than WiretapGate. This is the BIG one we’ve all been waiting for. Yes, Pizzagate is much more radioactive, as is the much larger Pedogate. However, it’s clear that those two ongoing scandals will never break out into the MSM (mainstream media) — AS A SERIOUS NEWS STORY — until WiretapGate first explodes the Global Control Matrix. The Global Control Matrix is both the overarching superstructure and hidden infrastructure by which the countless agents of Deep State execute their myriad schemes to maintain planetary command and control. You see, such a multi-millennial conspiratorial plot really all comes down to intel. Especially good intel. Because whoever controls the flow of the intelligence worldwide effectively controls the world. Hence, the 17 intelligence agencies, which make up the U.S. Intelligence Community, always determine who the real king is, as well as who the kingmakers are. Actually, it is those who control the intel chiefs who pick the kings and queens, presidents and prime ministers around the world. With this critical understanding, it ought to be clear that there is an epic war going on between the Trump Administration and Deep State. Deep State‘s three primary pillars are currently under massive assault by the Trump wrecking crew. The Company, as the C.I.A. is widely known in intelligence circles, as well as the NSA, are right in the crosshairs of Trump’s closest advisors. So are the MSM (Mainstream Media) and the FED (Federal Reserve System). The sides of this war are not totally black and white. There are surely some white hats operating in the intelligence community, although the majority is likely wearing dark hats. That’s because they have all been ponerized over several decades. Likewise, there are undoubtedly an unknown number of dark hats furtively working inside of Team Trump. Nevertheless, the general conflict which defines this intensifying “War of the Titans” clearly pits the globalist entity known as Deep State against the nationalistic patriot movement many call the “Trump Movement”. This war is quite global because the seeds of nationalist-driven revolutions have been sprouting across the Earth realm throughout this decade. Brexit and Grexit, Frexit and Nexit are just a few examples of this citizen’s liberation impulse manifesting worldwide, as was the election of Donald Trump. 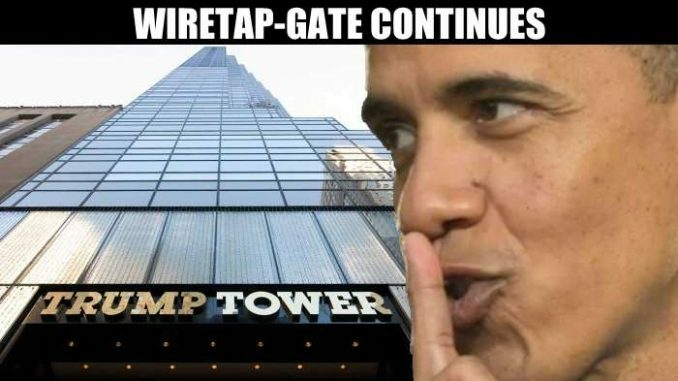 Because Deep State has refused to allow Donald Trump to govern as POTUS, much less carry out his several mandates, he was forced to expose WiretapGate. Had he chosen not to, his administration would have suffered death by a thousand cuts…as it is currently with the dramatic crash and burn of Ryancare. Because there was such justifiable mutual suspicion between the spooks and the Trumpsters, the relationship got off to an extremely rocky start, as it was destined to. After all, the C.I.A. did everything in its power to seal a victory for the career arch-criminal and inveterate globalist Hillary Clinton. She was Deep State’s selected heir to the treasonous Barack Hussein Obama, who was just as certain to give the C.I.A. everything it ever wanted like BHO did. Key Point: The C.I.A., together with the MSM and the FED, form the very backbone of Deep State. This triad has many functions but its essential task, which is assigned by the World Shadow Government (WSG), is the efficient maintenance of the perpetual war economy. To do that effectively the WSG must exercise strict control over all agents of Deep State, especially those who are in key positions of political power. Hence, the 17 intelligence agencies, working in concert with the major MSM news outlets, keep the politicians, key appointees and other government officials in check. The FED is also used to exert financial pressure as needed to produce specific political and economic outcomes. As far as the primary intelligence tools are concerned, a top-secret supercomputer known as “The Hammer” is as good as it gets. This exceedingly powerful and unusually capable supercomputer is hidden away deep in the bowels of the Military-Industrial Complex. Until fairly recently no one even knew “The Hammer” existed, just as many other similar advanced IT technologies remain hidden. Because of how it’s routinely utilized by intel heads, there is very good reason why the “Masters of Intelligence” have kept “The Hammer” highly classified. Now that the cat is out of the bag, there’s no putting it back in. Nationalist leaders worldwide are quietly going ballistic at how this “patently unlawful spying and surveillance regime” has been aimed at every perceived enemy of Deep State. They know it’s also being used against their powerful friends and influential collaborators–24/7–and that there’s nothing they can do about it. The whole world now knows that the American Republic has fallen prey to this totalitarian tactic of control of its political class. Hence, the illusion of a constitutional republic in the form of democracy USA has been forever shattered. There is no question about the existence and illegal use of “The Hammer”, as some in intelligence circles have insinuated otherwise. However, what’s even more curious is how the CIA-controlled MSM has gone out of its way to maintain Washington’s dirty little secret. This conspiratorial behavior by the Fourth Estate is not only highly incriminating, it speaks directly to an organized plot to overthrow the Trump Administration. However, it is the rogue elements within the U.S. Intelligence Community who are most responsible for running this black operation on American soil. The only thing that WiretapGate and Watergate have in common is that they both begin with “W”. Outside of that, WiretapGate makes Watergate look like a walk in the park. 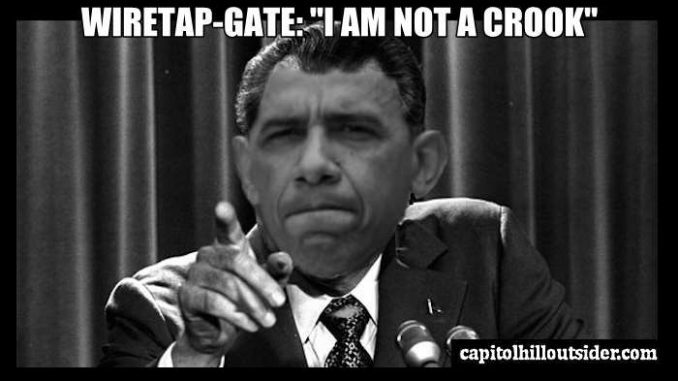 The fact of the matter is that WiretapGate is so serious because it implicates so many high-level Obama Administration officials and members of the U.S. Intelligence Community in a highly coordinated criminal scheme to sabotage Donald Trump’s candidacy for POTUS. If that’s not serious enough, this conspiratorial plot also involves the secret services and intelligence agencies of foreign nations. Each entity was specifically chosen in order for the perps to present “plausible deniability” during a potential investigative process–an anticipated eventuality which became a reality. More significantly, foreign assets were employed to basically commit sedition against a sitting POTUS, as they have been enlisted to commit treason in the past. Hence, it can be said with absolute certainty that the entire US intelligence apparatus made Team Trump the target of unprecedented spying and surveillance. And, that the United Kingdom’s GCHQ was the prime mover and go-to organization for the real sensitive stuff that was done in this regard. The Brits are the absolute best for denying their obvious law-breaking with a perfectly straight face. There is no doubt that much of this black operation was farmed out to GCHQ for the sake of plausible deniability…which is exactly the way it turned out. In light of these earth-shattering revelations, it’s now incumbent upon President Trump to really begin to drain the Swamp, especially the one inside the Beltway. There simply is no other alternative at this point since the CIA swamp monsters will only retreat from the spotlight “temporarily” to lick their wounds (EXPOSED: CIA – The Swamp Monsters). More dangerous to Team Trump, however, is that the C.I.A. et al. will further consolidate their power, which has been unlawfully arrogated to itself based upon the false pretext of ‘national security’. This is precisely why the false allegations of a “Russian election hack” with Team Trump collaboration were floated in the first place. The top-tier of leadership within Deep State knew that it would need a very strong justification to ‘wiretap’ Trump. So, they simply fabricated one. That’s why the MSM echo chamber nonsensically makes stuff up about Russia–to keep the fictitious story alive for as long as possible. Only in this way can the intel heads continue to this very day to ‘wiretap’ Trump. And then transmit false data to the MSM which reflexively produces and disseminates the daily fake news about Team Trump.